‘Cause that’s where they charged a big fee. But oh! so much laundry to fold! Almost like she is a sniper. So should I fight or should I write? Preheat oven to 350 F, butter a glass dish thoroughly. Mix it up, dump into the glass dish. Mix this up, sprinkle on top of apple mixture. I also like the crunch factor, so whatever nuts I have at home I just pile on as much as I dare. …instead of letting them pile on. Maybe I have a lazy bone or have a thing with procrastination, but it is SO EASY to let dishes pile on, or leave toys out, or counter cluttered, etc. The dishwasher is saved for occasions when there are guests since we don’t generate enough of them in one day. But to leave dishes in the sink and come up with busy excuses is something I’m a pro at. Then at the end of the day I’m dreading the task because there are TOO MANY! Anyways, since my baby is too young to be assigned chores, it’s still up to me. So I trick myself into playing a timer game. If it’s 10:14, how many dishes can I wash by the time it’s 10:20? Usually when the time is up, I’ve either completed the task, or have like 3 left so of course I’ll wash them. And same concept if something’s being timed and there are 4 minutes left: how much of living room can I tidy up? So even if I’m not done, it’s a lot cleaner than it was 4 minutes ago! A few days ago I experienced a most overwhelming feeling of mommyness. Like in a not so great way. I was flooded with all these negative thoughts about how I missed the freedom of being able to come and go as I please. Don’t get me wrong, I would absolutely never for anything in the world change my status from being a mommy. I love it, and love my baby, and everything that comes with it. It just hit me that my conversation topics with my hubby have dwindled down to poopy potty successes! and what new inedible foods baby tried to eat! and if I’m lucky, what spectacular item is now available for sale at the grocery store! It got to me that I am not going to work and hanging out with adult people. I am not going to school and obtaining an education with like-minded individuals. It got to me that while my baby reached a milestone of crawling around furiously around the house, it meant any extra “fun” things (such as cooking something more interesting than a 5 minute meal) have become almost non-existent. Yep I chose this route. I did go through the career-oriented phase, I obtained a degree, and made a conscience decision to stay home and raise my baby. Although I secretly judged looked down on women who went to work right after having a baby (yes I know certain circumstances call for it, I’m referring to working NOT out of necessity), and thought that they are cheating the system by having somebody else raise their kid while they’re out “socializing” (in the workplace, haha), I now UNDERSTAND WHY! It is incredibly difficult to have the patience and tenacity to handle being a stay at home mom! It’s hard! 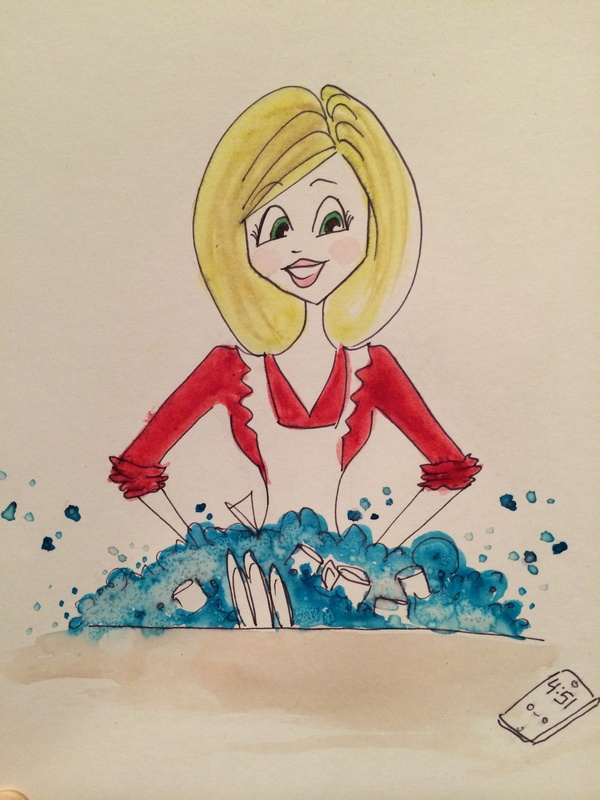 The daily housewife/mom things start catching up and I realize I’ve become a different person! I don’t want to become less interesting to my husband, I don’t want to be irrelevant when conversing with other people, I don’t want to have one major area of interest that I can talk about. I keep thinking about the previous generation, especially in my old country, and how parents dealt with life. It didn’t seem that they had much free time to themselves. Or did they? Perhaps because of the fact that many families lived close together it was easier to have somebody watch kids while you go walking to the store a few miles away? Anyways. God give me strength and wisdom to be the mother I was called to be. Throughout this whole motherhood journey, I keep realizing what a terrible idea it is to judge other mothers and the choices they make. Worst thing you can do. Everybody is just trying to survive and stay sane. I never imagined that I would one day go through feelings like that, where I’m envious of those career-focused moms. I’m still holding on to the greater picture where I want to have the most influence on my child, as opposed to somebody else babysitting or raising my offspring. Alright, off to another great day! I got hit with the macaron bug. When I tried them a few years back, I didn’t like the taste. I thought something was wrong with me because they look so beautiful and dainty and so are expensive that they MUST taste amazing! After multiple attempts at trying them (even 2 macarons in France when we visited) I gave up. Fast forward a few years: my friend made some, I fell in love, and decided to make some myself. Since I went gluten-free, most of my baking went out the door. 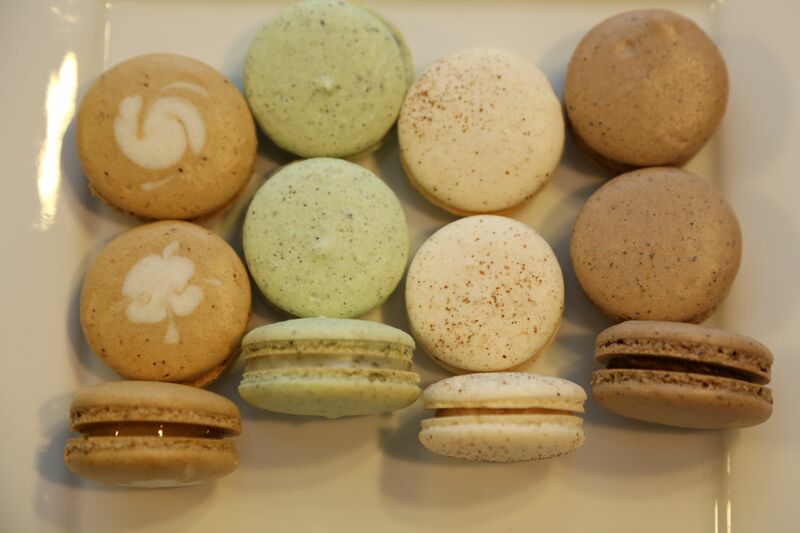 This macaron adventure allowed to me to bake and experiment with a plethora of flavors and recipes and ideas. 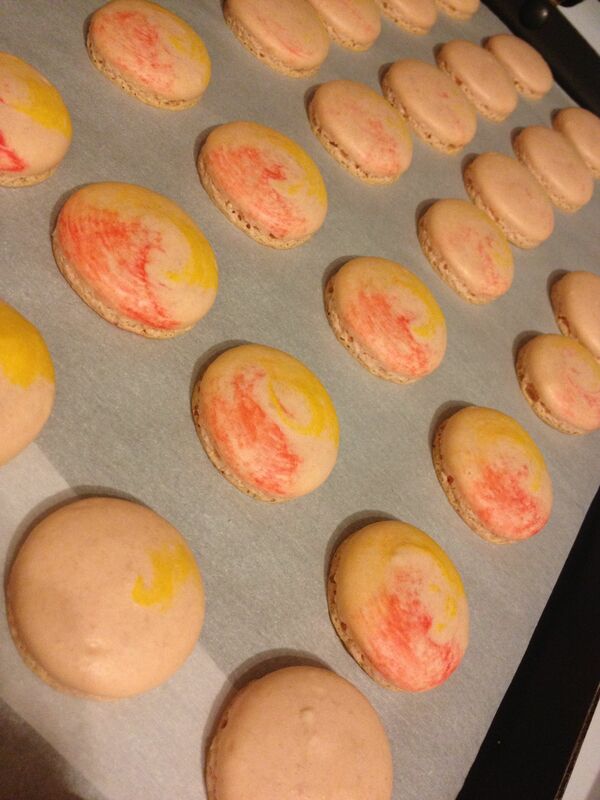 But a lot of macarons turned out beautifully. However, I would encounter random batches of hollows, or explosions, or whatever, and knew that the recipe wasn’t perfect. 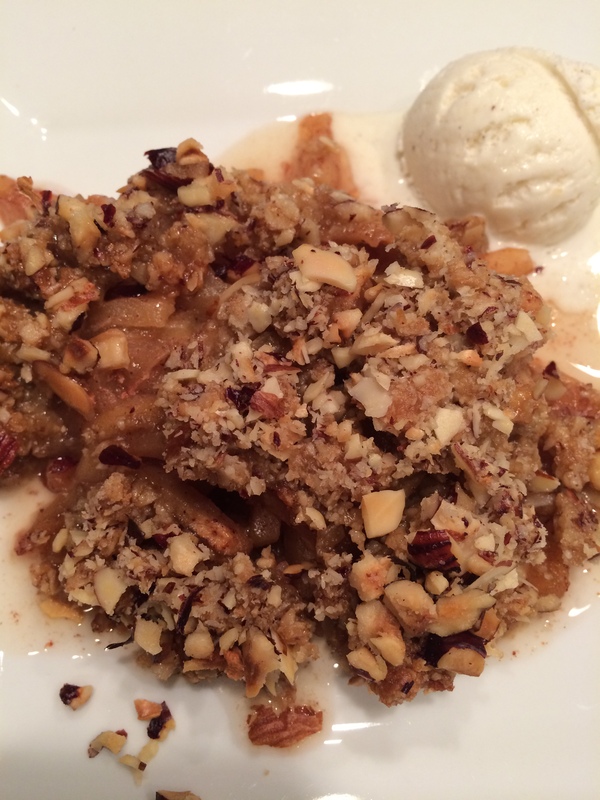 Here is a recipe that FINALLY renders consistent results. 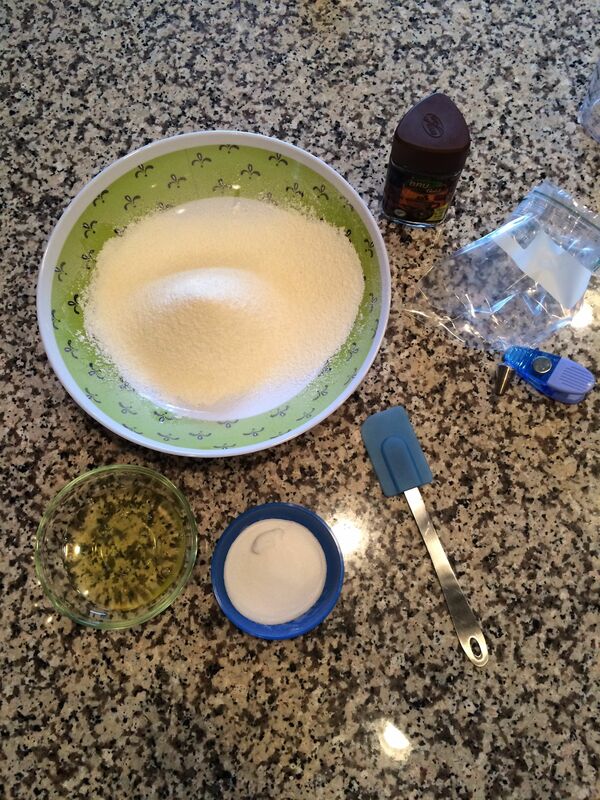 I highly recommend using a scale to weigh ingredients because egg whites can range A LOT! Also since I sometimes grind up my own almonds, it really helps the amount be accurate and consistent. Sifting business: the worst part of this whole process. I tried skipping it, I tried whisking it as a shortcut, I tried to throw in the almond flour/powdered sugar into grinder (it’s a tiny coffee grinder) and none of that seemed to do the trick for me. 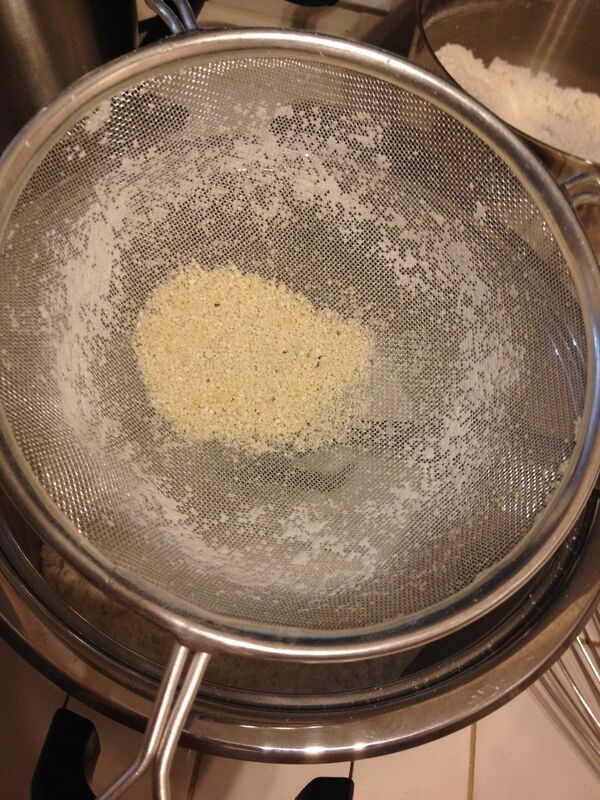 Sifting must be done. Sometimes I’ll add a few extra grams so whatever doesn’t make it through the sifter can be tossed out or saved for later without me having to grind it & then sift it. The egg whites are to be at room temperature, whether they sit out overnight, a little while in warm water, or even having the egg whites microwaved for 5-10 seconds, depending on your microwave. BTW the microwaving helps a lot when it’s a humid day: the moisture gets sucked out after microwaving so there aren’t much problems with the shells drying. 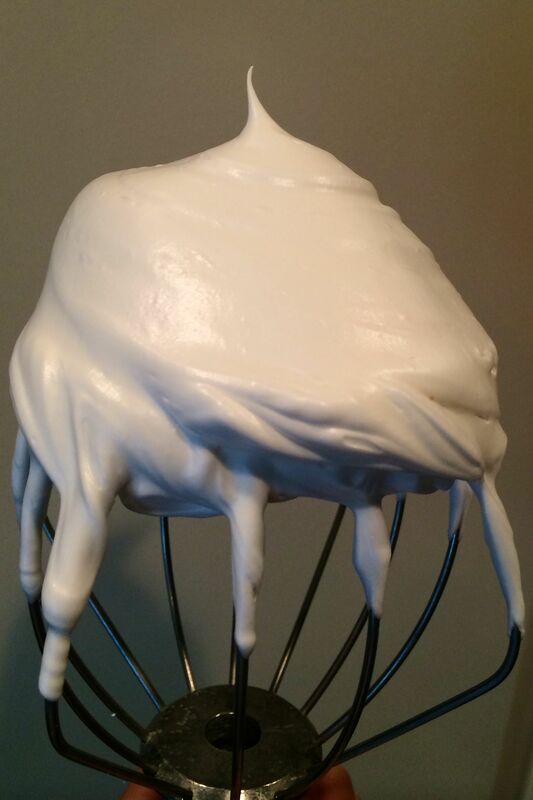 Make sure to not overbeat where the egg whites start falling apart. It looks like a broken sand castle at that point. BTW if you reach that state, don’t stress too much, just add some egg white to the mixture and take out a bit of the over mixed portion (try to keep it about the same amount) and mix it in. It usually fixes the problem. 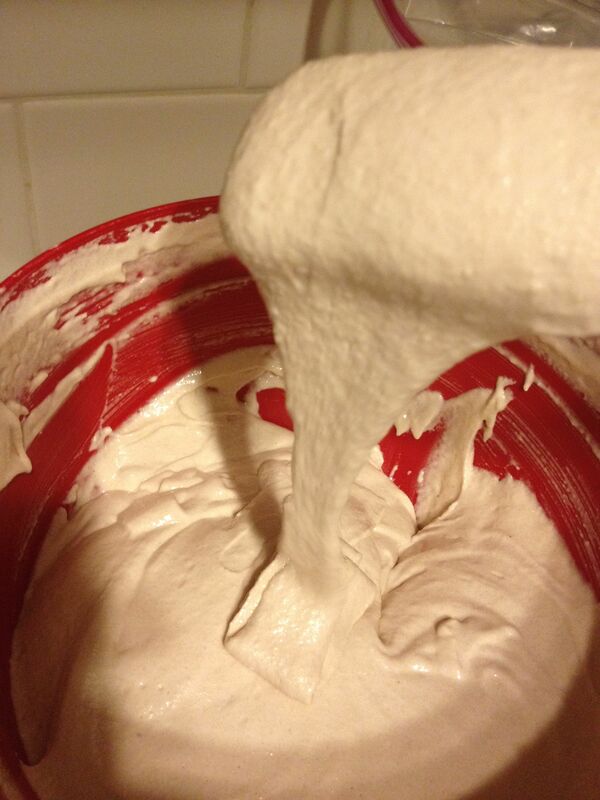 Add about half of the flour mixture to the egg whites, gently mix it in with a rubber spatula. Once it’s somewhat incorporated, add the other half and do the same thing. 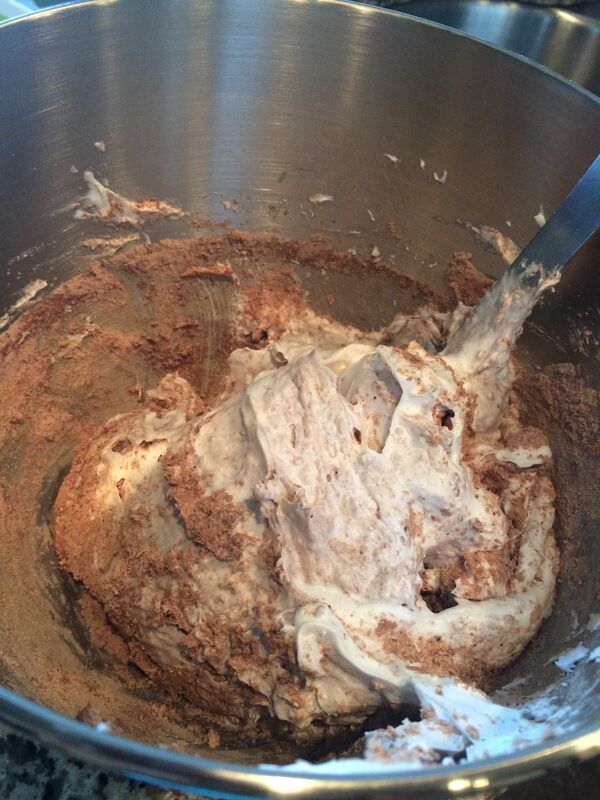 When all the dry ingredients are wet, you can mix/fold more vigorously. The macaronage process is the official fancy term for this. 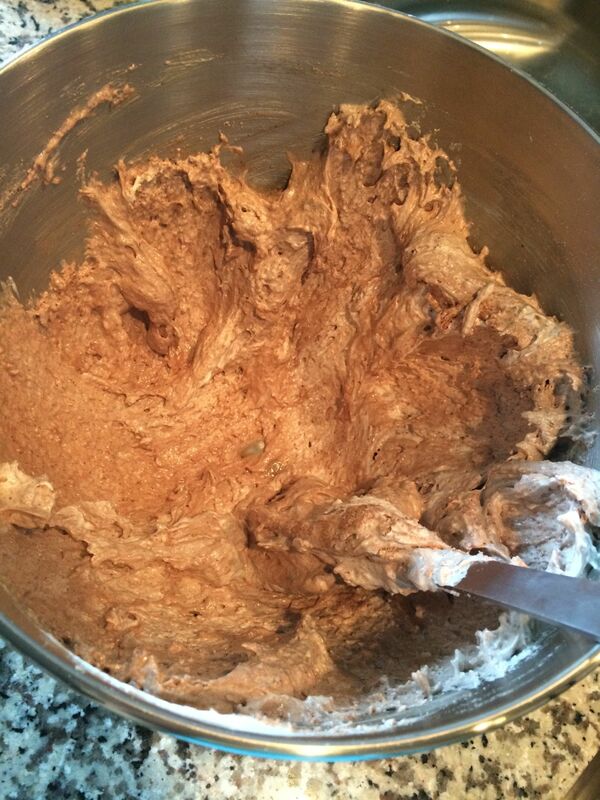 I take the spatula and drag out the batter against the sides of the bowl, then scrape it back in and repeat a few times. 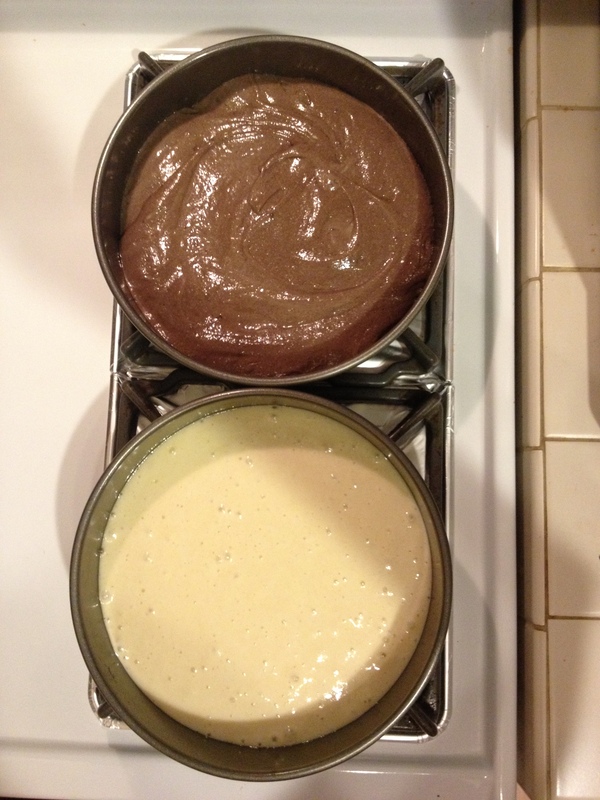 When the batter starts looking beautiful you want to slow down. It will flow slowly off the spatula. 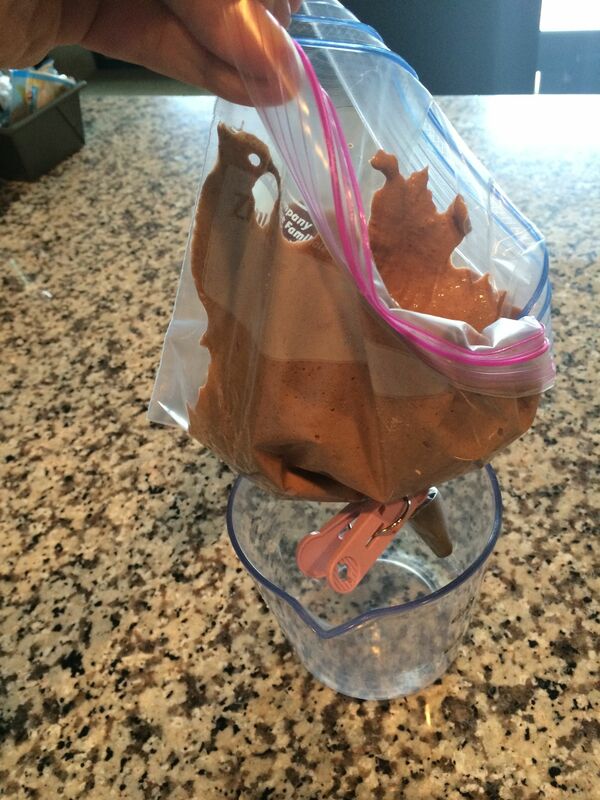 If it’s flowing too fast, yeah I’m sorry, too bad: the batch is ruined. You’ll get flat macarons that will still taste good but they won’t look like they’re supposed to. It’s supposed to be like thick pancake batter. I have never seen lava in real life so I can’t say it needs to have lava-like consistency (which so many macaron blogs state). Pour/scrape the batter into a pastry bag or zip lock bag. Pipe out circles onto parchment paper or silpats. I printed a template of circles for myself that I made in Word and use it underneath the mats. 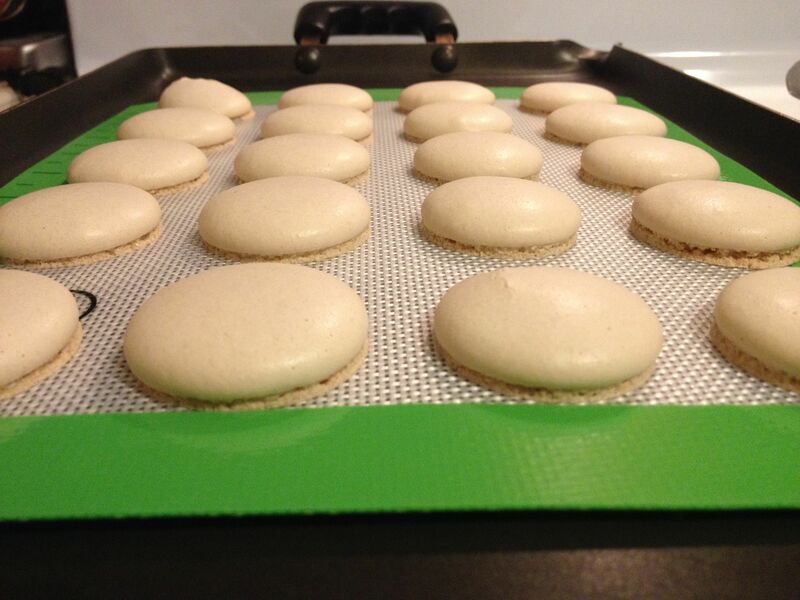 Parchment paper bakes macarons a minute faster. After they’ve been piped, tap the sheet a few times against the counter to flatten out & eliminate any air bubbles and then WALK AWAY. 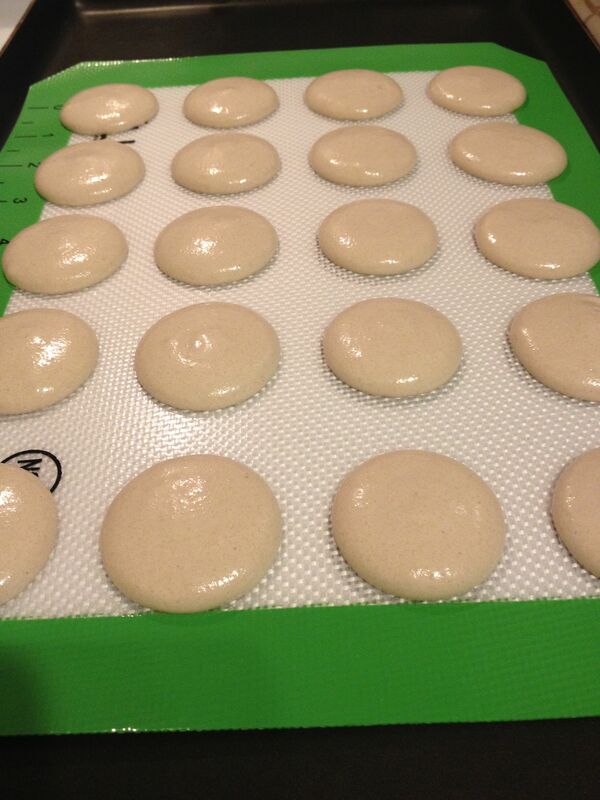 Let the macarons rest until they’ve hardened and have a little skin on tip. Basically when you touch them, it’s dry, and won’t leave any batter on your finger. Sometimes this takes as quick as 15 minutes, other days it could an hour. If it’s super humid, expect to wait over 2 hours for them to dry. Thus the microwave trick for the egg whites when you know it’s humid outside. Then preheat the oven to 295. My oven temperature is inaccurate; I actually set it to 275 but the thermometer reads 295. Buying the thermometer saved me lots of trouble. It costs about $4 at Safeway. 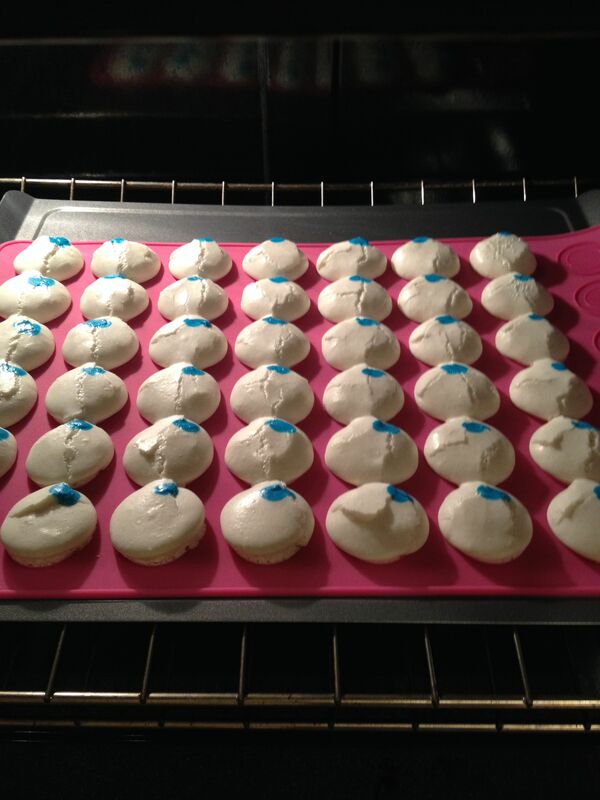 Bake the macarons for about 13-14 minutes. When you try to lift if off the parchment paper and it lifts up, it’s done. On the silpat you won’t be able to lift it so don’t try that method to test if it’s ready. Wiggle the top of a macaron; if it’s very wobbly then it’s not ready, if it’s quite sturdy then it’s done. Let them sit and cool off on the pan before taking them off. Fillings can be numerous! 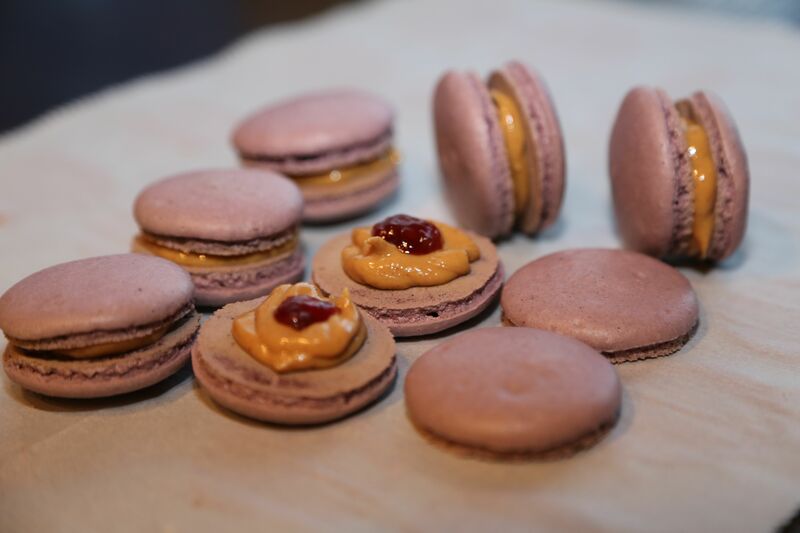 I’ll have another post for several different kinds of fillings, but the main point is to fill the macarons, put them in an AIRTIGHT container and stick them in the fridge. They need to mature to have the flavor fully take over the macaron shells. Eat them the next day! So I had been wanting to make lasagna for the longest time, and I FINALLY found some gluten-free lasagna noodles. 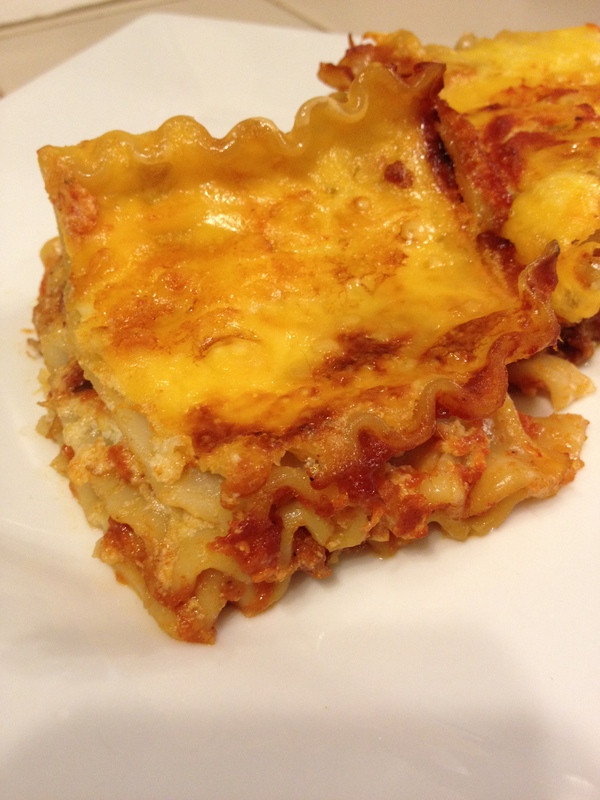 I began following a basic lasagna recipe but then ended up with a whole different twist. I cooked some beef in the slow cooker with spicy BBQ sauce until it was very soft and pulled it apart. The next day the leftovers went into this lasagna. Mix the bell pepper, pasta sauce, and beef together. Mix ricotta cheese, egg, shredded cheese and the seasoning together. Place about a third of meat sauce mixture into a pan. Layer with noodles, cheese mixture, meat sauce mixture. Again, noodles, cheese, meat sauce. Finally top with noodles, whatever is left from cheese mixture and place cheddar slices on top. Cover with oiled foil, bake for 45 mins and remove foil; bake for 15 mins more. I like to turn the oven to Broil the last few minutes to get the final crispy cheese texture. 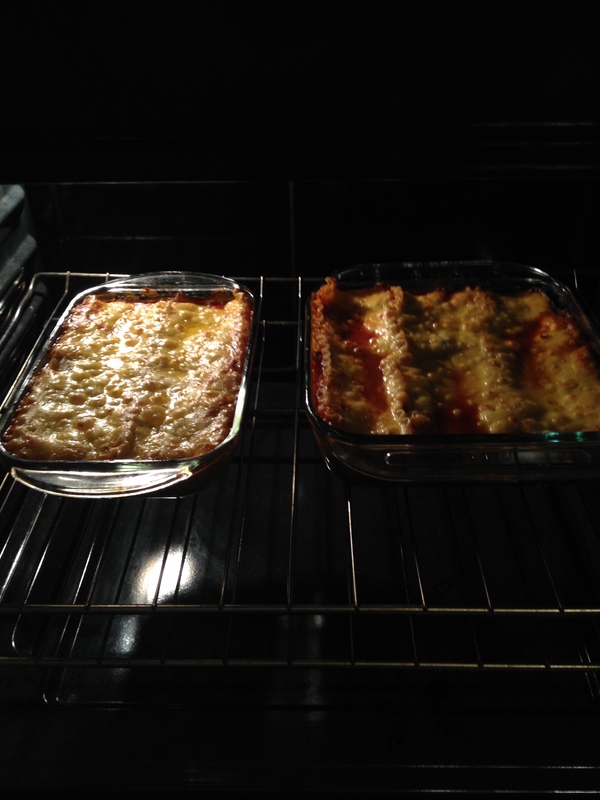 I made 2 smaller lasagnas so I could freeze one for later. Not a photogenic food item but oh so delicious! I have no clue how this cake got it’s name but that’s what we called it in Ukraine. Bake for approximately 15 minutes (depending on size of pans and how much batter is in them), until the white batter is golden and slightly puffed up. Check by inserting toothpick in center and if it comes out clean, it’s ready. 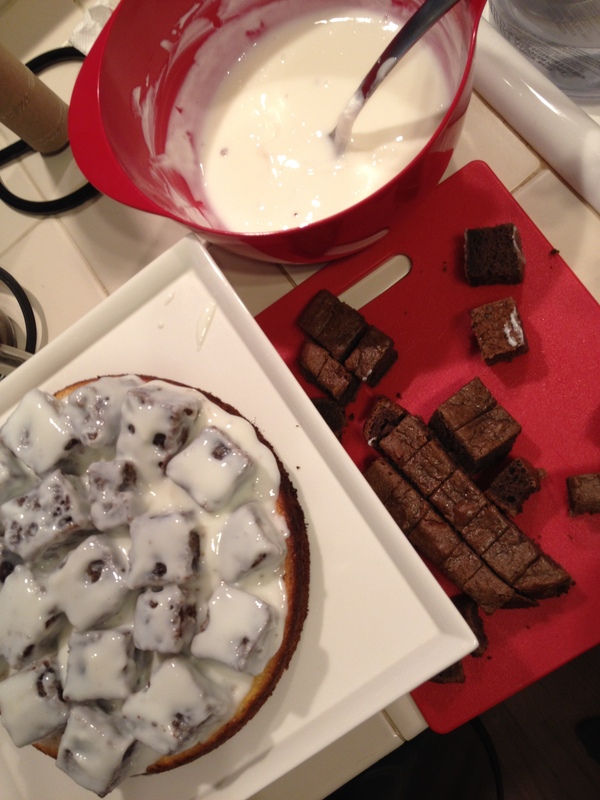 Cut up one of the cakes into pieces, dip into frosting mixture and pile on top of the other cake. 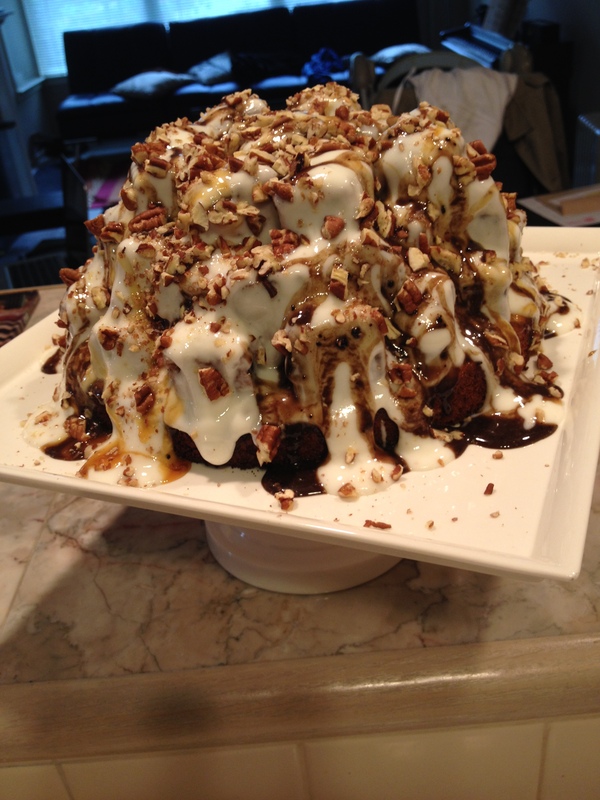 Drizzle with chocolate syrup or caramel and sprinkle toasted chopped nuts on top. Refrigerate. *Note: I forgot to check if I had all the ingredients before I began making this, and apparently I was almost out of sour cream. I replaced the rest of what I needed with the Fage Greek yogurt and it turned out perfectly delicious! 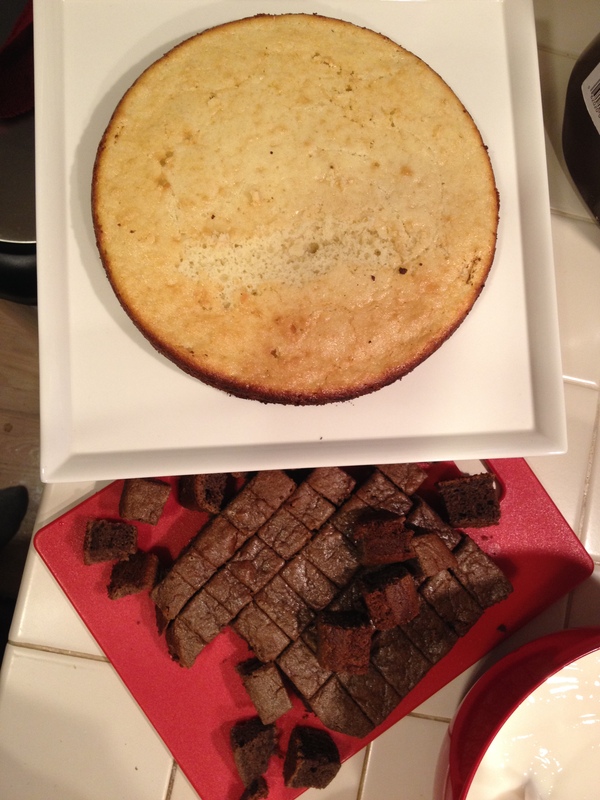 I poured a bit more into the cake that will be chopped into pieces. The smaller the pieces the more frosting will be needed; I think I had to make a bit more than what was called for in the recipe. There are many sites that have Top 10 lists of what nobody told them about delivery, parenthood, babies, etc. I have a list too. 1. Adrenaline rush. I have heard of women being exhausted after delivery, and although I had barely slept for 48 hours, after the baby arrived I napped and was awake for about another full day. Being on painkillers dulled all pain, so I was out and about within hours, using the restroom, greeting visitors, being super excited! 2. Saying “no” to visitors. On the previous note, after we came home, I felt great still, so accepted visitors on a daily basis. In the evenings I was exhausted and within a few days I felt so ridiculously overwhelmed and physically getting sick, that I realized it was time to take a break from people coming over. I wish I blocked a few days for people to not come over at all (see why I didn’t in point 1). 3. Weight. I weighed 2 lbs less when I came home than when I had gone into the hospital. The liquids from the IVs and apparently the birthing process itself made me swell up. No swelling during pregnancy but after, go figure. It took about a week to go away, and then I was just about at my pre-pregnancy weight. My appetite was enormous! I ate so much that I gained a few lbs after a few weeks, so now I’m being more aware of what and how much I’m eating. 4. Accepting help. Being the oldest in my family, I apparently developed a somewhat controlling and high expectations type of personality. I expected myself to easily tidy up the house and prepare quick meals as well as learn how to care for the newborn. All at the same time. I declined most meal plan suggestions (BAD idea), and the people that DID bring something… I am ever so grateful for them! I think if my mom was here, or perhaps a sister who has been through this before, I would probably have her stay for a few days for assistance. I know that if one of my sisters here has a baby, I will have much more perspective: don’t overstay a visit, bring lots of foods, insist on helping! 5. Lowering standards about house cleanliness. Yes, I’ve read lots about taking it easy and not doing too much around the house in the beginning. Well, I’m sorry, but it bugs me to have dirty laundry piled up, sink full of dirty dishes, messy countertops, stuff laying around, etc. It is OK. PERFECTLY OK to take it easy. My husband kept insisting for me to stay in bed or sit and not do anything housework related. People who visited us and have had kids know what this journey is all about. Yet there I was, “quickly” going through the dishes, picking up stuff laying around because “it was on the way to the room”, “being bored”. I repeat, it’s OK, let it be. It isn’t the end of the world. As long as it won’t be like that forever, it doesn’t need to be done immediately. For future note: don’t use dishes, buy one-time use plates, forks, cups. 6. Rest. Because of the post #4, I wasn’t doing too much resting. Which didn’t help me with my recovery. Even though I was on painkillers and didn’t feel too much pain, as soon as I started easing off them, I realized I couldn’t yet. I felt worse later on than I did right after delivery. Recovery takes much longer in this case. For future note to self: Absolutely stay in pajamas for the first week or even two, this will discourage any “work” that needs to be done. Stay off the feet unless ABSOLUTELY NECESSARY (example: restroom, refill water bottle, get a snack). Husband will help, trust me. 7. Pregnancy is much easier compared to what’s coming. The time is also known as “the 4th trimester”. Baby is an angel, very calm and peaceful, however, an infant. Which means lots of care: the diapers, feedings and changing takes up so much time that whatever time is spent sleeping isn’t much at all. Sleep deprivation is an understatement. 8. Breastfeeding is a sharp learning curve. You don’t master it in a day or even a week. Not even a month in my case. Yep I cried sometimes. By the second month it finally got easier. Pumping helped. Definitely not easy going places (plan where to pump, or feed, change of clothes, cloths, etc.) Better to stay home for 2 months to get all this stuff down, THEN start going places where I’ll be for a few hours. 9. It IS possible to go places with a newborn. We went to 5 Guys Burgers as a first “restaurant outing” at about 2 weeks of baby’s age. After that every week or so we’d go out and eat. Baby is sleeping, pumped milk is in a bottle, so 1-2 hour outings totally worked out and helped my sanity level. 10. Baby blues are real. Managing it: recognizing signs, being self-aware, going outside for at least a 10 minute walk daily, putting on some makeup, reading some encouraging bible verses, communicating about it to spouse. Thank God it didn’t move on to the next level. 11. I’m completely clueless about babies. I read lots about pregnancy and delivery. I cannot say the same about newborn baby. Without a doubt several gray hairs claimed my head in the first month of baby’s life. If baby cries: needs food, diaper change, comfort, or sleep. What if none of the above? It could be gas. Or maybe something hurts? What if she’s hot? Or too cold? What if she ate too much? What if the milk doesn’t taste good because I ate something weird? Why isn’t baby falling asleep? Why is baby spitting up? Is that normal? Is that too much spit up? Why is baby choking? What is reflux? How can I manage it? What if she chokes in her sleep? Are wipes too cold for her bum? Is she going through too many diapers? Why is each diaper poopy? Why is she sleeping so much? What is a feeding schedule? 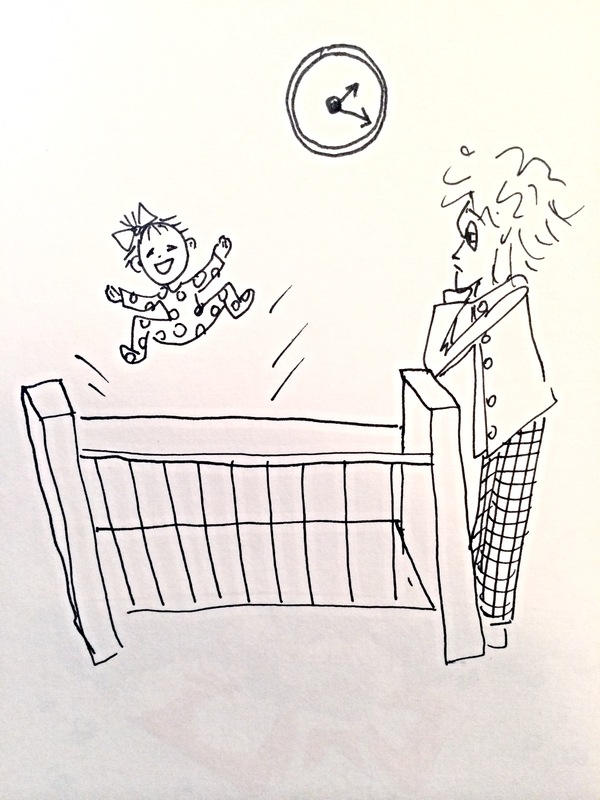 When can baby be “trained” to sleep through the night? Why did she catch a cold? What are home remedies for infants? 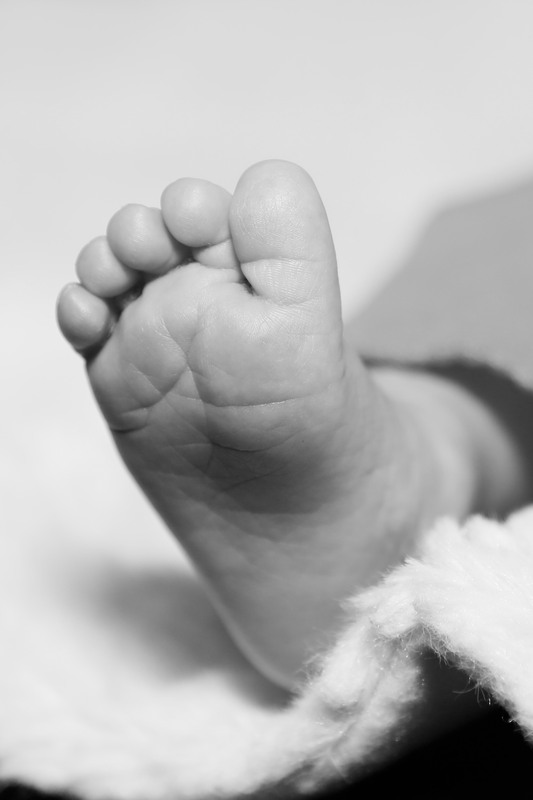 Why isn’t there medicine for newborns? Can she sleep on her tummy, or in our bed, or only in crib? And so on and so forth. Lots and lots of information is available, much of it contradicts itself, people are full of advice, often contradicting what others say. Future note to self: Do research but do not obsess about it and if it sounds too funky, ignore it. People will offer lots of advice, even more so than during pregnancy. Accept it graciously! Doesn’t mean you’ll use it. To answer some of my questions above: reflux management- smaller feedings more frequently, keep elevated during and after feedings, elevated during sleep. This means feeding schedule is somewhat on demand as apposed to very much structured. Sleeping was a struggle for a while: she slept in crib, she slept very much propped up with blankets in a Boppy, slept in our bed, slept in carseat, slept on stomach, slept unswaddled, slept swaddled. Yes, it’s quite the variety but when baby isn’t falling asleep, you try anything to get them to sleep. Now she’s becoming more regular with sleeping on her stomach in the crib. Establishing a light routine of changing, feeding, reading, and placing her in crib so she can have a good night’s sleep. Last few days (at 11 weeks) she is sleeping for 6 hours, has a quick feeding and sleeps for about another 3, then the day begins. 12. Don’t take on too much. I used to think stay at home moms, especially with one baby, have it super easy. This is the time to catch up on projects, continue being involved in church, etc. NOT TRUE. It takes all day long (24 hours) to care for a newborn. They say sleep when the baby sleeps. It’s easier said than done because by the time you quickly brush your teeth or prepare some food and eat it and go to lay down, baby is up for the next cycle of changing, burping, feedings. Note to self: Now isn’t the time to have people count on you. Your baby needs you more, so focus on that. Take on projects after baby is older. You will drive yourself crazy otherwise. 13. How much I missed my own mother. I didn’t expect that one. It’s been so many years I thought I really got over it. It’s not like I’m unable to do things around the house or cannot get answers or don’t have friends; I do have all of that. It just seems that nobody except one’s mother will truly comfort you when you’re beginning the journey to motherhood. One who will take care of you, care for baby, tell you to take it easy, and provide sympathy in the first month or two after baby arrives. The takeaway from this: when my other sisters will be having babies, it is my job to take my mother’s role and do what she would do.